Hundreds of people have protested in Cannes against a film about Algeria's struggle for independence against France. The film, Hors la Loi by French-Algerian director Rachid Bouchareb, opens at Cannes on Friday. 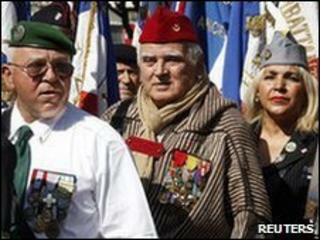 The demonstrators, who included right-wing politicians and French veterans, claim it is biased against France. Algeria gained independence from France after a brutal eight-year war that ended in 1962. Hors la Loi (Outside the Law) is about three Algerian brothers who are evicted from their ancestral home when it is occupied by a settler family in 1925, following their story over the next several decades. It has stirred strong reactions in France for several weeks ahead of its release, particularly over scenes dealing with a crackdown by French troops in the town of Setif in 1945. Thousands of Algerians - estimates range from 15,000 to 45,000 - and about 100 European settlers were killed. On Friday, demonstrators faced riot police as they paraded in central Cannes holding banners and French flags. They included former settlers as well as Algerians who fought in the independence war for the French, and are known in France as "harkis". Bouchareb has accused critics of rushing to condemn the film before watching it. At a press conference in Cannes, he said he hoped that it would foster open debate and that people would then be able to move on. "I knew that the colonial past and the relationship with the colonial past between France and Algeria is still very tense but I think the reaction and all the things that have been said before anyone's seen the film, have been excessive," he said. Hundreds of thousands of people were killed during Algeria's independence war, which caused political turmoil in France, triggering the collapse of the Fourth Republic in 1958. Bouchareb also directed Indigenes, which was released under the English title Days of Glory, and was nominated for the best foreign film Oscar. It is about North Africans fighting for France in World War II.